To make the burgers, mix the lemon juice and the lamb mince in a bowl. Blend the oil, garlic, chillies, cumin, coriander, turmeric and salt in a food processor until they become a paste. Stir the paste into the mince, and once combined, make into 10 burger patties. Chill until you're ready to cook them. To make the yoghurt sauce, combine the yogurt, cucumber, garlic clove, olive oil, lemon juice and fresh mint in a medium bowl. Season with salt and black pepper. Stir to combine, cover, and refrigerate until ready to use. To make the salad, place the cabbage and carrots in a bowl and dress with salt, pepper, oil and lemon to taste. Toss well and chill until needed. Brush each burger with a little oil and grill under a medium heat for 4-5 minutes on each side, or until cooked through. 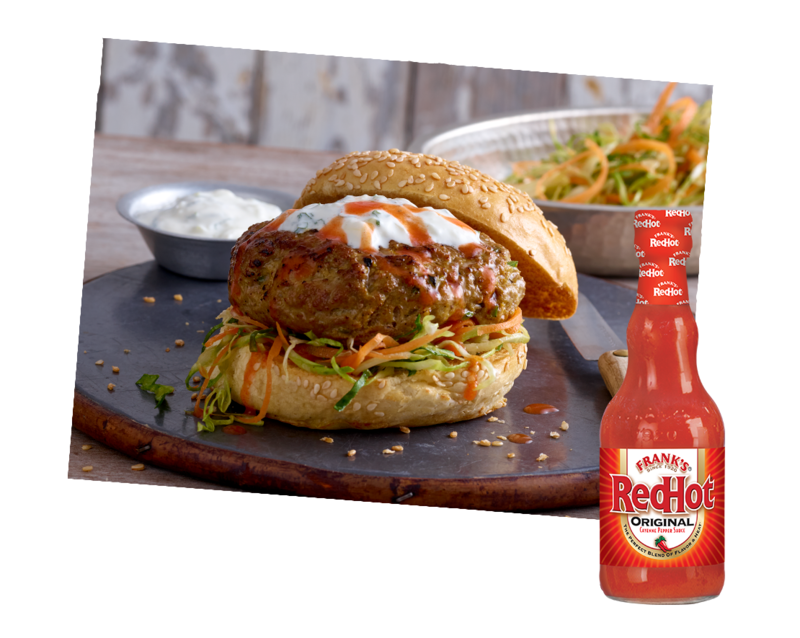 To assemble, place the cooked lamb burger on the bun, top with the yoghurt sauce, salad, tomato slices and Frank's RedHot Original Cayenne Pepper Sauce. Serve with extra Frank's RedHot Original Cayenne Pepper Sauce on the side.